(LWI) - The Liberian government has commended faith-based organizations for their critical role in providing education and enhancing peace building in the country. Speaking during an event to launch the ‘Waking the Giant’ program to support implementation of the United Nations’ Sustainable Development Goals (SDGs), the acting Minister of Foreign Affairs B. Elias Shoniyi said the initiative being rolled out by The Lutheran World Federation (LWF) can help to rebuild the country and empower people still recovering from almost a decade and a half of civil war. 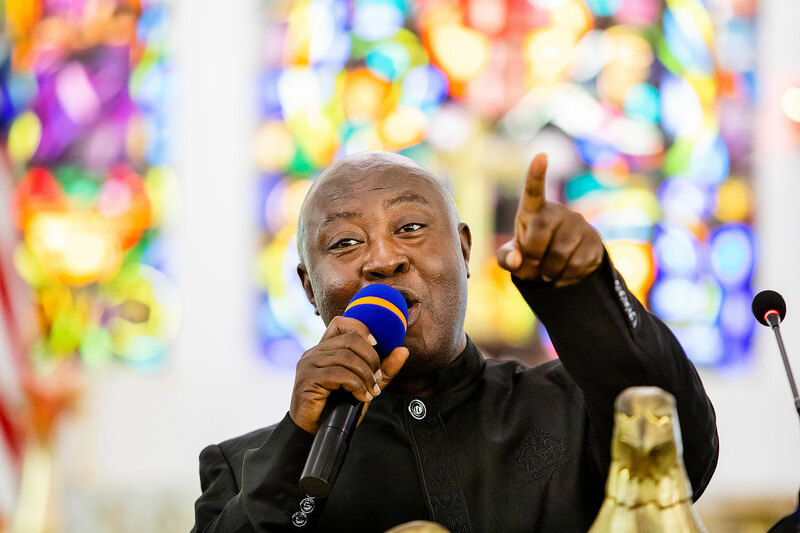 “We are all aware of the very significant influence of the church on Liberian society, and the role and interventions that the church has been making since the declaration of independence of this country,” he noted. While the government is seeking to expand access and quality of education, there are more faith-based schools than public schools in the country, he added. Shoniyi emphasized the “Pro-Poor Agenda for Prosperity and Development,” Liberia’s five-year (2018-2023) accelerated development plan towards achieving sustainable development, “is aligned very strongly” with the 17 SDGs. Hon. B. Elias Shoniyi, acting Foreign Minister of Liberia, speaks during the launch of the Waking the Giant initiative at the Liberia Council of Churches General Assembly at St. Stephen Episcopal Church, in Monrovia, Liberia. Liberia’s WTG program was launched on 29 November at a high-level event in the capital Monrovia, hosted by the Liberia Council of Churches (LCC). It is part of the global LWF ecumenical initiative that aims to provide local churches and faith-based organizations with tools and training to contribute effectively to the 2030 UN Agenda for Sustainable Development. 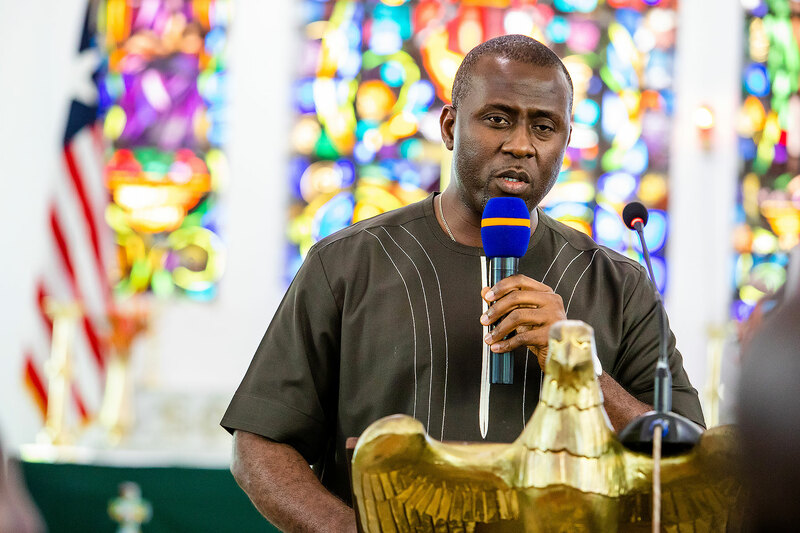 Bishop Dr Jensen Seyenkulo of the Lutheran Church in Liberia, who is also the ecumenical council’s first vice-president, said the church has “always been involved” in development work, serving people in remote areas which the government and other organizations cannot reach. “We have the experience,” he said, but this contribution has not always been recognized. We should be able to showcase what we have done. … Waking the Giant is going to address this gap by mapping out, doing surveys of churches’ contribution to the SDGs. Saint John York, the National Coordinator of Waking the Giant in Liberia, speaks during the launch of the Waking the Giant initiative at the Liberia Council of Churches General Assembly at St. Stephen Episcopal Church, in Monrovia, Liberia. The LWF inaugurated its global ‘Waking the Giant’ program in Geneva on 10 October, focusing especially on five of the SDGs: health (SDG 3), education (SDG4), gender equality (SDG5), reducing inequality (SDG 10), and promoting peace and justice (SDG 16). It launched its first national initiative in Colombia in mid-November. LWF program coordinator Julia Brümmer said the launch in Liberia was the start of a promising journey to engage local churches towards the 2030 Agenda. “This will provide visibility and strengthen their contribution to areas such as health, education and gender equality to ensure that no one is left behind,” she added.